Venturing down the rabbit hole of job hunting can be challenging and overwhelming. With user experience (UX) design, that hole can seem particularly deep and wide. A multidisciplinary field, it encompasses user research, visual design, prototyping, testing, and much more. So, What Does a UX Designer Do? 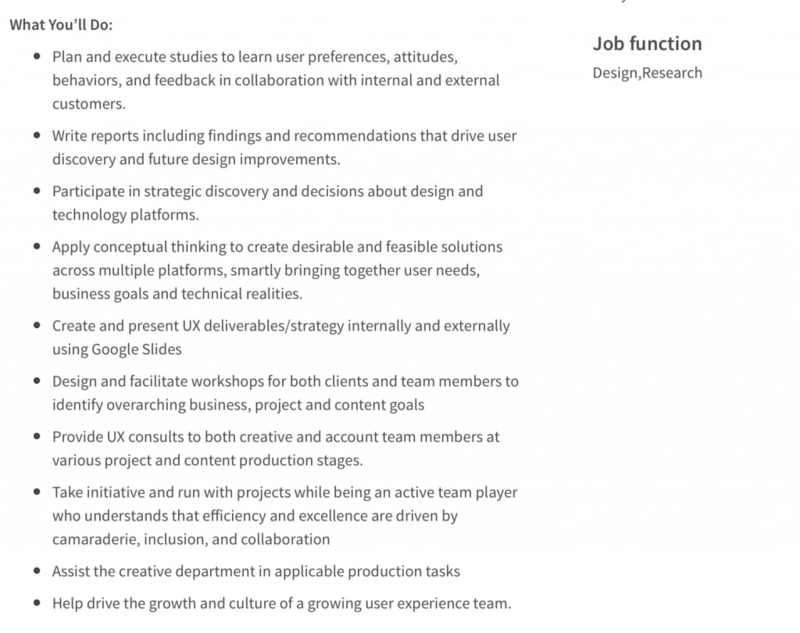 Many companies require a jack-of-all-trades in UX design, so they concoct a cocktail of UX roles for the descriptions they post on job boards. 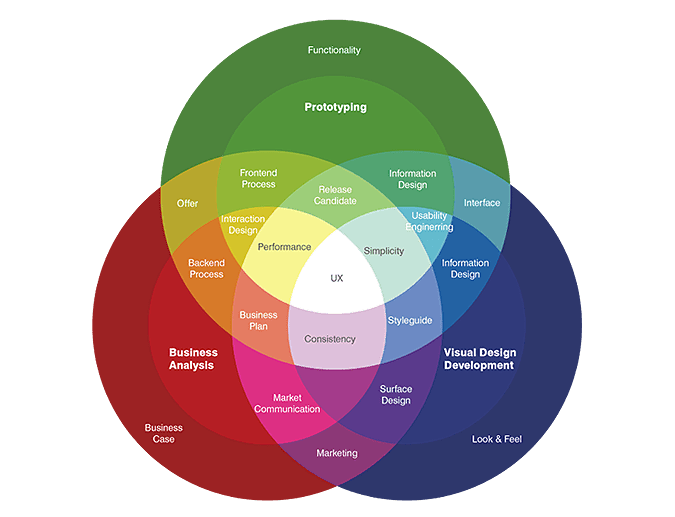 Others understand the length and breadth of each specific role under UX design better and put forth clearer, more focused job descriptions, such as a job posting for a UX architect, a UX researcher, and so on. 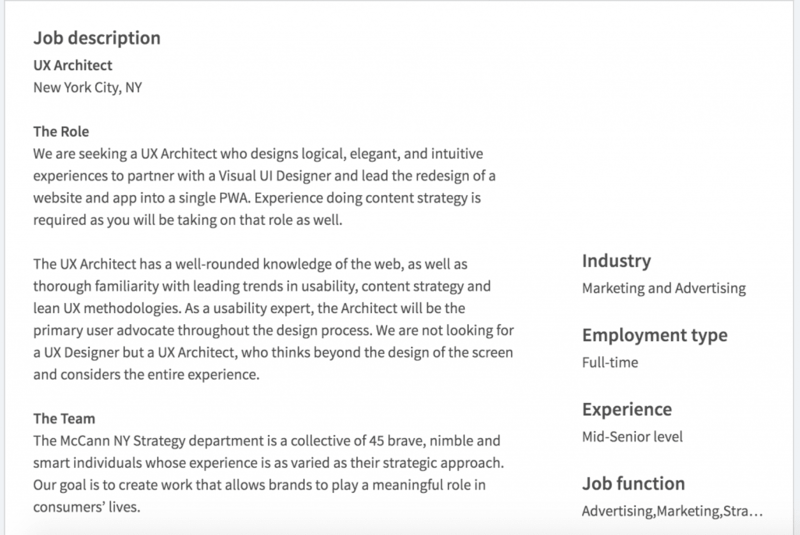 The UX designer description for the position presented above mixes user experience and user interface (UI). It requires the candidate to manage a variety of UX design responsibilities including researching and prototyping. 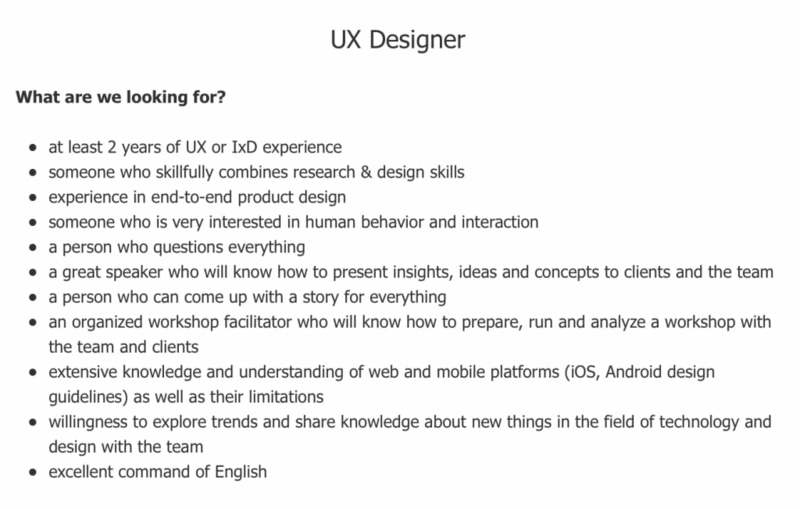 However, this example of a UX researcher shows that the employer is looking for people who excel at the research subset of UX design. Hence, the job details are related to the research work only. Such flexibility in using the term UX design can be mind-boggling. To clear up any confusion, let’s study the various UX job titles. But first, let’s take a step back. What Does UX Design Include? For a long time, UX design has been interlinked with the look of a product. However, these days the “feeling” of a product has come to the surface. This is what more accurately describes modern UX design. This is the foundational stage of UX design, centered around market and user research. UX design depends on understanding customer needs, goals, motivations, and behaviors. Therefore, research helps designers get into the mind of the target audience and sketch a design accordingly. Through solid research, the designer can make informed decisions instead of throwing darts in the dark based on assumptions. Excellent channels for conducting research include focus groups, online surveys, and interviews with users and stakeholders. Competitive analysis is another viable research channel. The collected data is then analyzed and used to develop informed personas. These are fictional representations of real end-users that the designer is targeting. The next stage in the UX process depends on these personas. At this point, UX designers sketch the product’s design based on the persona created at the end of researching the target user. In this phase, the designer structures the content per the scenarios. Scenarios are narrative ways of representing the customer’s journey or a day in their life. They explain how the product (typically a website or app) fits into the user’s life. It is crucial for a UX designer to accurately take into account each of the steps in the customer journey. Wireframing is creating an illustration that showcases how the final product (program, app, website, or software) will look. The technique is valuable for visualizing the product design and enhancing customer experience on the whole. In this phase, a UX designer’s responsibilities include preparing a draft version of the product. The process orbits around experimenting with the design, correcting any errors or inconsistencies, and developing data to use it to improve original ideas. Once these first steps are taken, prototyping allows the designer to share the product with other team members, including management. Moving forward, a designer needs to check the product’s usability and functionality thoroughly. At this stage, UX designers learn about any problems that may arise when users interact with the product. Product testing may be as simple as observing customers or it may include complex test procedures such as presenting varying versions of the product to learn which is received the best. Designers may also create surveys and questionnaires. What’s more, designers may interview users if they identify problem areas. The simplest of all the user testing methods is observing users while they interact with the product. UX design does not pack its bags and go once the final product is released. UX is a constant process that lives as long as the product is in use. The product needs to be continuously tested to see that it meets customer satisfaction. It also detects the need for any improvements and takes steps accordingly. A common measurement is how likely a customer is to recommend the product to others. In this role, UX designer responsibilities typically include creating the blueprint of the entire process. In other words, the designer is the architect of the experience, which explains the alternative term of information architect. 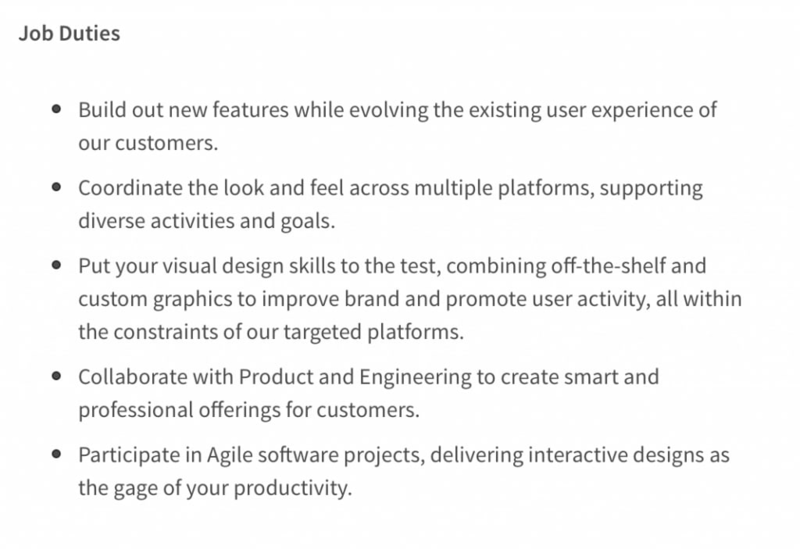 The scope of this job focuses on creating the user interface based on research, wireframing, and more. In essence, the UX designer role ensures that business requirements are effectively translated into design. To understand the UX designer’s role better, quickly scroll back up and see what all of UX design includes. Keeping this in mind, the common UX designer description created by many companies talks about the entire UX design process. 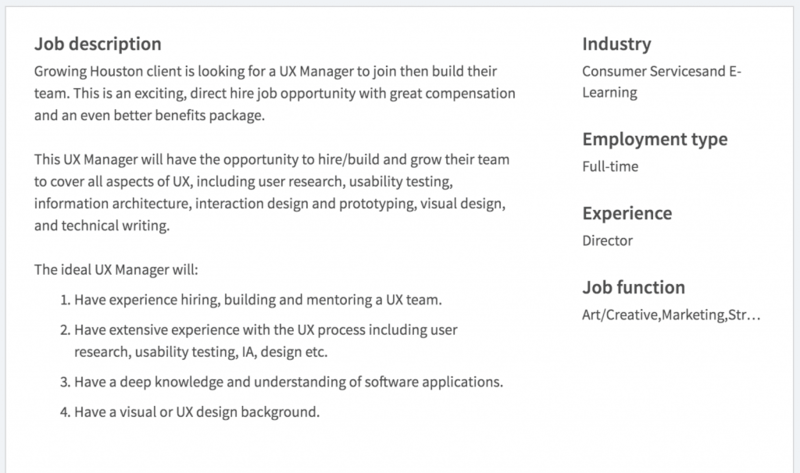 If the job advertisement comes from a small business or startup, it generally will require an individual to cover all the phases of UX design. However, if the job post comes from a large organization, it may be looking to appoint a person in the senior position to overlook the UX design process. 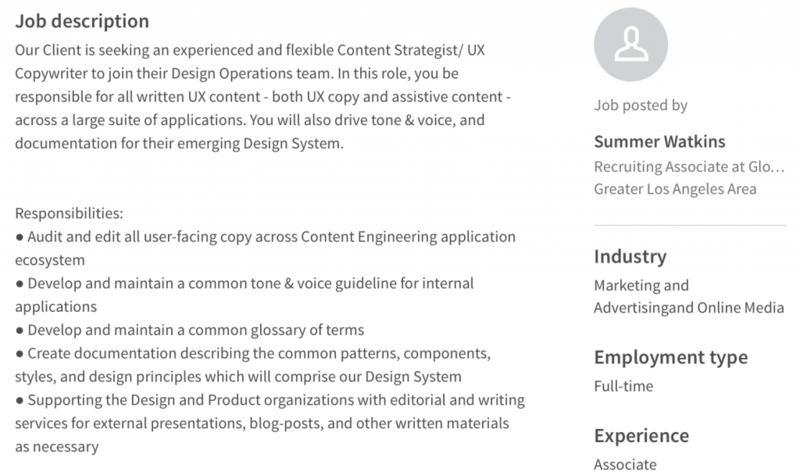 In this context, job titles that imply seniority are mentioned below, along with two examples of a current senior UX designer job description. Visual design is a fairly self-explanatory subset of UX design that focuses on how the product looks and is laid out. Collaborating: working closely with the UX designer and developers to learn about the product and target users and then submit the design. Designing: preparing an interactive, visually appealing design starting with creating a style guide, designing each screen, planning a responsive design, designing UI elements (such as sliders, buttons, and icons), and working on the interactivity of each UI element. Prototyping: repeatedly testing the designs to see them in action and identify flaws that can be corrected. Research and usability sit at the helm of UX design. User experience is dedicated to fixing user problems, which can only be understood by conducting research. It helps to create designs that are relevant to the target audience and easy for them to use. Furthermore, research helps you understand how you can reap returns on the investment made on your design. It forms the cornerstone of UX design before the design process begins, during it, and afterward. The goal is to ensure that you know the pain points complicating your users’ lives, understand how they interact with your design, and keep tracking any usability issues that may arise. UX engineers are liaisons between the design and engineering teams. They are responsible for taking a design and bringing it to life with code. A UX engineer’s arsenal includes computer languages such as HTML, JS, CSS, and so on. Let’s lay this out stepwise for a better explanation. Once a UX researcher conducts his user research, he heads over to the UI designer (visual designer/UI artist) to convert the research work into a good-looking design. In the next stage, the UI designer submits his work to the UX designer, who decides if the wireframe is technically feasible. After the engineer develops a prototype, he goes back to the designer and collaborates further. The final version is then sent off to the front-end developer. Consequently, a content strategist understands both business goals and the user needs. She then works on planning, developing, and delivering relevant content that bridges the gap between business goals and user needs. She aims to maximize the profitability and usability of content via a content lifecycle that includes analyzing, planning, writing, and editing it, followed by distributing, managing, and monitoring it. While combing through job listings, you will realize that there are three major categories of people who want to hire UX design professionals: large organizations, the middlemen or the agencies, and startups. These organizations, such as Microsoft and IBM, understand the nature of the myriad roles that fall under the UX design umbrella—and they have the funds to support that understanding. Therefore, you can expect to see jobs for specialized roles under this category. At the other end of the spectrum, startups and small businesses generally look for a factotum who can take care of all the UX-related work. 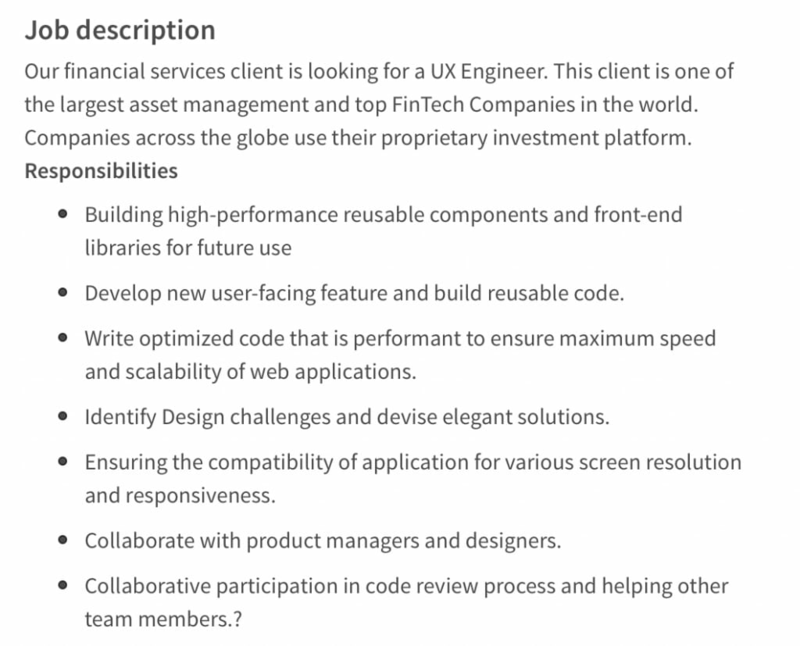 They don’t have the resources to hire specialists, so they expect the person selected to manage UX design completely. Not surprisingly, the recruitment requirements for agencies tend to be in the middle of the extreme ends of expectations of small and large organizations. Now that you understand what to expect from different employers, the question is: what should you do? You have the answer to this. Your professional goals, your talent, and your skill set will determine the job you should go after. 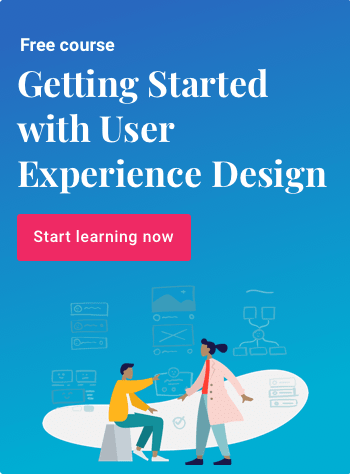 If you want more guidance, you can learn all about the fundamentals of UX design by enrolling in our mentor-guided course that will take you from beginner to building your own UX portfolio. Click here to learn more.